This crazy Irish sunshine is absolutely incredible. 30 degrees today, did the Irish ever even think this possible?! Sunbathing at lunch time, ice-creams everyday and an acceptable ‘get out’ clause on all mundane chores which need to be done because ‘ah sure the sun is shining better get out in it before the rain comes’. In light of all this new found heat, this evenings cake is a somewhat welcome reminder of the chill factor! Molly’s Mam, my future mother in law’s birthday was at the weekend and to celebrate I put together this ‘frosty’ lemon drizzle cake. Although I used a basic lemon drizzle cake recipe (recipe to follow in the coming days) this cake could of course be made with any type of delicious centre. 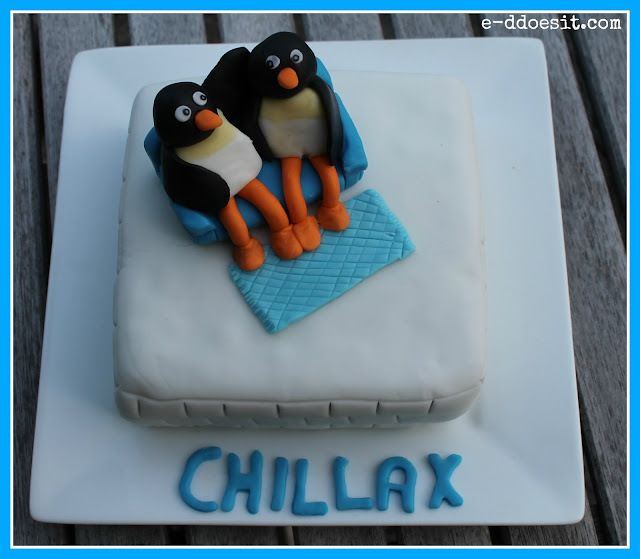 I used Tesco white roll out fondant icing to cover the main cake, using a wheel tool to add the ice cube detail on the sides. 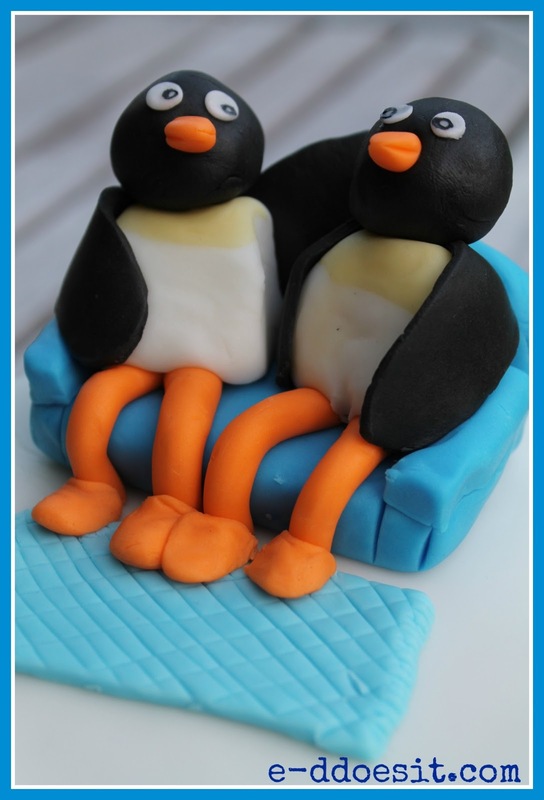 The penguins are also made of solid fondant icing, using a combination of black white and yellow to form the bodies, with some striking orange to build the legs and feet. All the coloured fondant was coloured by hand (using Wilton gel food colourings) with the exception of the black which I always buy pre-coloured. I created the couch using fondant shaped into rectangles, and again using the wheel tool to add the little details which make it look a little more realistic. 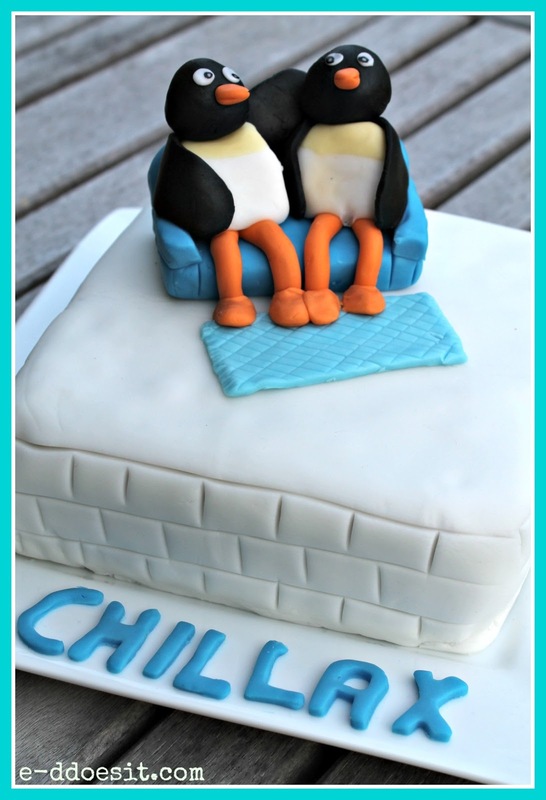 When it comes to sugar craft and creating memorable cake toppers, often opting to put a character of animal sitting down cuts out a lot of heart ache. You don’t need to be quite as accurate with proportions and size as a sitting figure hides a multitude! If your figure is sitting it also means you don’t have to worry about how to support your figure in a standing position. It's always useful to read content from other authors and practice something from their web sites. Very useful info specifically the last section :) I care for such information much.